Khenpo Lodrö Zangpo (Tib. མཁན་པོ་བློ་གྲོས་བཟང་པོ་, Wyl. 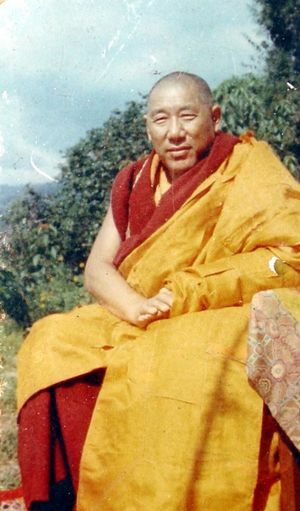 mkhan po blo gros bzang po) (1924-1986) was one of Sogyal Rinpoche's tutors. He was from Tritso (khri tsho) Monastery in Derge, the same monastery as Khenpo Rinchen and Khenpo Lhoga. He studied with Khenpo Dragyab Lodrö together with Khenpo Appey. After coming into exile, he lived at Ngor Monastery in Gangtok, Sikkim. He was also a teacher of Dzongsar Khyentse Rinpoche. He passed away in Bodhgaya in the Fire Tiger year (1986) at the end of the sixteenth calendrical cycle. This page was last edited on 30 June 2017, at 23:55.